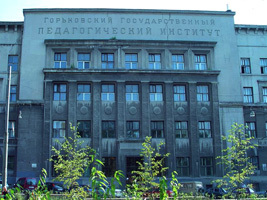 Nizhny Novgorod State Pedagogical University (NNSPU) was founded in 1911 as Nizhny Novgorod Teachers Institute. In 1918 it was reorganised into NN Pedagogical Institute. Education of foreigners at pedagogical university started in 1995 and continues at the preparatory department and the academic study course. Classes in special subjects – chemistry, biology, mathematics, physics, computer studies, drawing and others (18 hours a week in the 2nd semester). Classes in these subjects are led by professors and university teachers. On completing the course of studies at the preparatory department foreign students are enlisted to any faculty of Nizhny Novgorod State Pedagogical University or any other higher educational establishment on the speciality chosen by a student. The Faculty of Physical Training (dean- Skitnevsky V.L.). The course of studies, based on secondary education lasts 4 - 5 years (except the years of studies at the preparatory department). Training in different subject areas is carried out both in special groups for foreigners (3 – 5 students) and in the groups of Russian students. Medical certificate: (AIDS certificate, international certificate of vaccination, notary certificate). The University provides the hostel and free medical care for foreign students. The dining room, gymnasiums, the library, the reading-hall, laboratories are at foreign students disposal. Student group consist of 4 – 8 students. All foreign students get grants fixed by the law of the Russian Federation. Have you chosen profession? Do you want to get higher education? Fine! We invite you study in Russia, to one of the three largest cities of Russia – Nizhny Novgorod. The city is situated in a beautiful place, where the Russian river Oka flows into the great Russian river Volga. More than one hundred thousand students from Russia, Turky, India, Nepal, Suria, Pakistan, China, Japan, Israel, the USA, Canada, Germany, France study in the higher institutions of Nizhny Novgorod. You can get technical, humanitarian, economic, juridical, medical and other education in them. We`ll teach you to speak and think Russian. Experienced specialists who teach foreign students the Russian language work at the Preparatory department of Nizhny Novgorod Pedagogical University. Special methodics make it possible for you not only to master the spoken Russian language but also to write lectures and read and master books on the speciality you have chosen. no database administration course on its own?